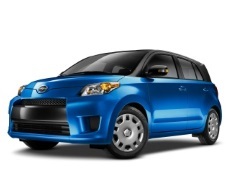 Correct Wheel Sizes, PCD, Offset, Rims and Tire specs for Scion xD series. Can I fit sCion XD rims on my 2008 Subaru Impreza? They both have a 5 x 100 pattern. Hi,Subi,For sCion XD stock wheels,the offset is 45mm,but 2008 Subaru Impreza have 55.the difference beyond normal error.So,You need add spacers to fit it.